Teleconferencing saves time and travel expenses for rural patients. Upon granting your referral appointment with Dr. Nathan Connelly, the next step to set up your initial consultation as a teleconference, is a phone call from Moonee Valley Specialist Centre to your GP. In this phone call, we make sure your referring GP or medical specialist has the means to conduct a smooth teleconference experience. Then we arrange a date and time that works for you, your GP and Dr. Connelly. For this consultation, you simply go to your GP’s clinic. The consultation will be conducted using real-time video and audio communication technologies. This allows you to see and talk with Dr. Connelly, just like a face-to-face consultation. The role of your GP during this teleconference will be to physically examine you, on behalf of Dr. Connelly. He will ask your GP questions related to your condition and physical symptoms to get the information he needs to make a diagnosis and devise your treatment plan. Subsequent consultations can be conducted via teleconferencing and are done the same way. Teleconferencing is the use of video conferencing technologies and broadband connections to conduct a real-time medical consultation between multiple parties in different locations. For now, Moonee Valley Specialist Centre offers simultaneous video and audio transmissions, like a face-to-face consultation, but over distance. Teleconferencing uses the software program, Skype, in conjunction with the practitioner and the patient sitting together in their clinic. Dr Connelly assesses the patient with the support of the practitioner. Together they develop a treatment plan of action. In the future, it will be possible for medical images to be transferred in real-time to GPs or other consultant specialists to speed up our patients’ diagnoses and treatments, and, more generally, to provide a higher level of health care. Why do I need teleconferencing? 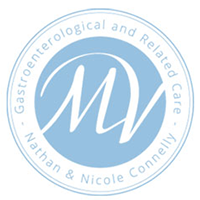 If you live in a remote or rural location, particularly where access to gastroenterology services is limited, teleconferencing will save you travel time and expenses, as well as hasten your diagnosis and treatment options. Teleconferencing provides direct access to Dr Nathan Connelly’s expertise, both for patients and practitioners, located in Medicare-designated ‘rural’ suburbs and/or who find it difficult to travel long distances. Teleconferencing is a program initiated by Medicare and is a bulk-billing consultation through our centre. To see if you are in an eligible area for tele health, visit the DoctorConnect page here.